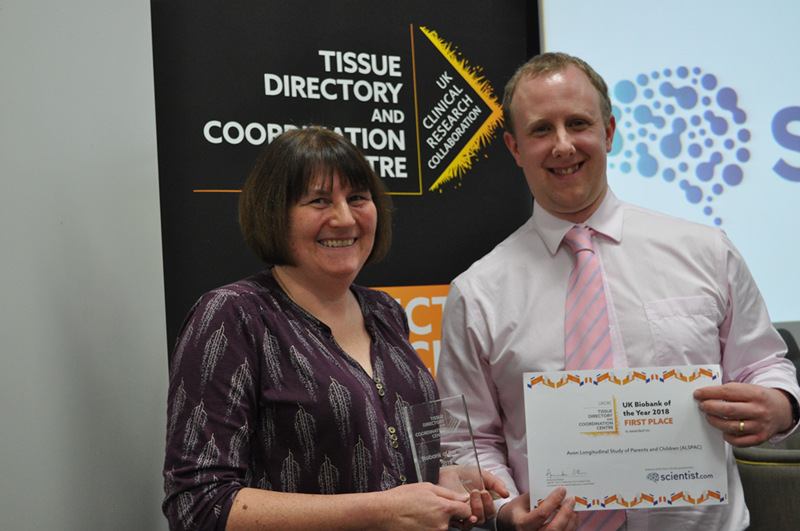 The UKCRC Tissue Directory and Coordination Centre (UKCRC TDCC) held its annual meeting, UK Biobanking Showcase, on the 27th November. The event is a chance for Biobankers across the country to get together and talk Biobanking. Several themes emerged repeatedly throughout the day, including the sustainability of Biobanking. 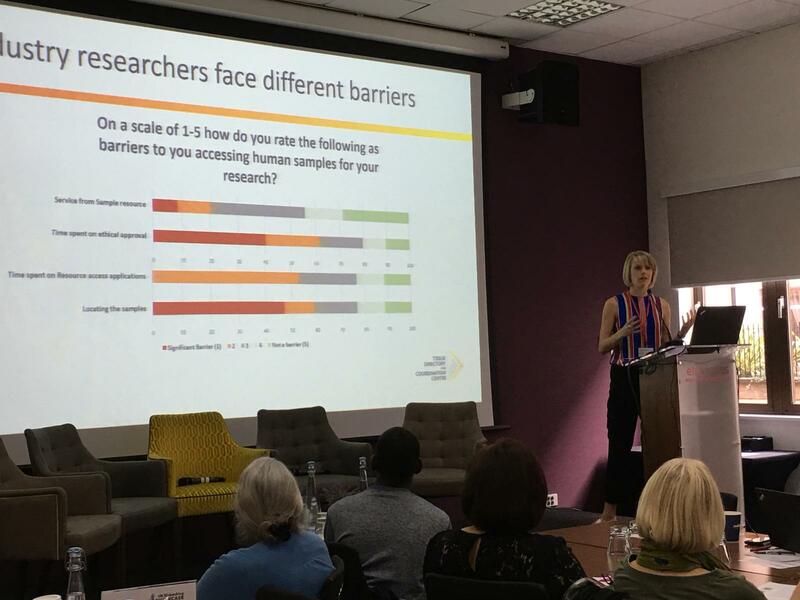 UKCRC TDCC Engagement Manager, Emma Lawrence (right), presented findings from a survey of researchers which showed that many still collect samples themselves. She also presented the barriers to samples access, such as time spent on MTAs, ethics applications and other forms of paperwork. Together, the results show that there’s room for biobanks to be attracting more users. She concluded that biobanks might extend their services to administrative support in the future. Sustainability was also one of three workshop topics offered at this year’s event and featured Sarah McDonald from HCV Research UK. Their biobank has almost bought in as much funding as they were awarded in their original grant. She shared some sustainability tips, such as investing in things critical to your operations while cutting back when things aren’t as vital. Amir Gander (Tissue Access for Patient Benefit) explained how his bioresource has moved from planning work in terms of requests, to planning in terms of “jobs done”. He cited clinical trials and stratification projects as examples of this. James Peach from the Medicines Discovery Catapult, outlined their four main aspects of sustainability that are needed to work with industry. The afternoon session on research infrastructure management also included cross-over on sustainability. Delegates learned of the financial management component of RI Train – a master’s degree programme and heard from Sharon King (Tayside Biorepository) on how the Scottish Biorepository Network model supports members’ sustainability. She discussed the Network’s costing model as well as equipment pooling, demonstrating their collaboration and cooperation. Quality management was programmed throughout the day based on delegate feedback from previous events. In the morning, delegates heard from a panel of researchers who discussed what they wanted from samples in terms of quality. The panel outlined where they sourced the samples they used for research, outlining their different motivations and requirements. After this panel, the quality assurance speed talks covered ISO 20837 for Biobanking, services from BBMRI-ERIC and the CM-Path quality improvement tool. Andrea Wutte (BBMRI-ERIC) and Gareth Bicknell (University of Birmingham) co-hosted a workshop on quality management which covered ISO 20837 and BBMRI-ERIC services in greater depth. As most workshop attendees came from resources that were HTA licenced, the ISO standard was explained in reference to HTA requirements. The event also recognised good quality sample resources who have gone above and beyond in supporting research. Alison Blair (NHSBT) gave an example of a clinical trial which is on-going and may lead to a new treatment for leukaemia. This all arose from the excellent quality samples banked at Bloodwise Childhood Leukaemia Cellbank, winner of last year’s Biobank of the Year Award. The event ended in announcing the 2018 winners, ALSPAC for first prize (pictured right) and CureME having an honourable mention. The third cross-cutting theme throughout the event was data management. Matt Styles, UKCRC TDCC Senior Developer opened the topic in the morning session through an overview of new developments to the UKCRC Tissue Directory, including API updates and responses to user feedback. In the data workshops, a number of discussions were held regarding anonymisation of data, discoverability of biobanks’ collections, and usability of biobanks directories. 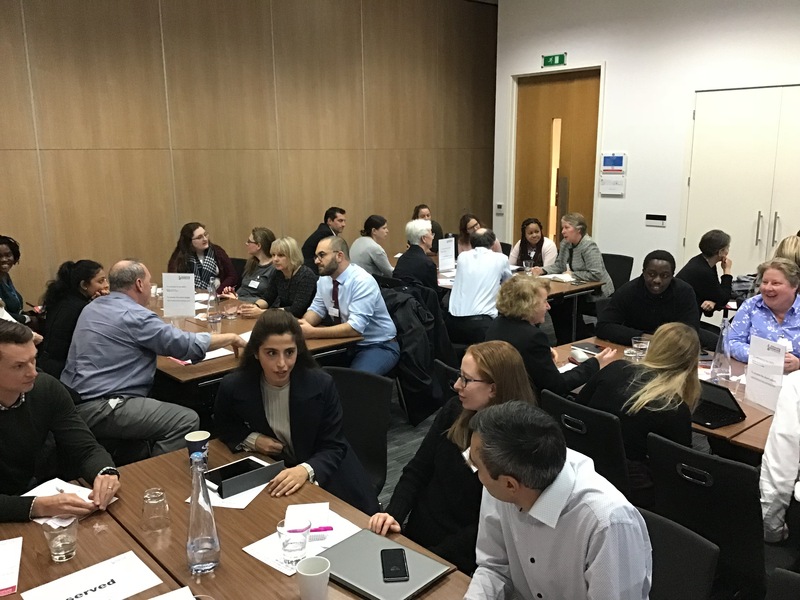 The world café style of the workshop meant that in-depth discussions could be broached with experts based on delegates’ current data management issues. The researcher panel discussion also referenced data, where data and sample quality were seen as equally important. Amanda Hunn (HRA) also made the link between the two topics in her talk about the HRA/HTA public dialogue project. The members of the public who participated assumed greater linking of tissue and data already existed. They wanted donation consent to be explicit on the possible linkage between tissue and data to ensure that donated information was not wasted. 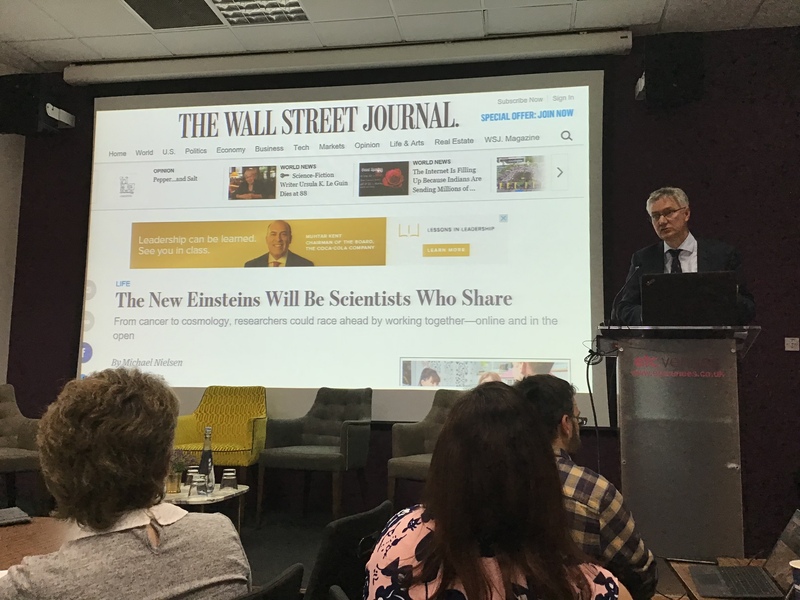 Professor Andrew Morris, Director of Health Data Research UK (HDR UK) He gave a rallying cry that the days of data ownership should be over, as it’s no longer acceptable to not share data of public interest. The date of UK Biobanking Showcase 2019 will be announced in the spring; sign up to our newsletter or keep checking our events pages for more information. This entry was posted in News and tagged events, showcase. Bookmark the permalink.